This is typical of many hovels in the burghs (walled towns) of Danelaw England during the Early Middle Ages; though a few of these buildings would have been found in the 15th century. 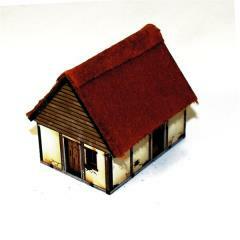 15mm Scale models supplied unassembled. Miniatures not included.